Here we are, five days before Christmas, still waiting. Thanks to our commercial culture, where Christmas decorations are put up some time in July, that waiting period seems longer than ever. As the holidays near, the waiting in traffic gets longer and longer. We’ve been waiting for the break from work, from school, to finally arrive. Some of us have been waiting for the new Star Wars movie for months, even years. And none of that waiting compares to the waiting of our Scripture lesson this morning. The story of Elizabeth, Zechariah, and their son John is a thorough summary of the prophetic and priestly traditions of the Hebrew Bible. Elizabeth is a descendent of Aaron, Moses’ brother, whom tradition considers the first of the priests. Zechariah himself belongs to an ancient priestly order, each order getting their turn to preside over the sacrifices at the Temple in Jerusalem. This time, Zechariah is chosen to enter into the Holy of Holies, the most sacred portion of the sanctuary. It was a once in a lifetime experience, ones that priests wait for their whole lives. And this is the moment when God chose to visit Zechariah with the good news: his prayers have been answered, and he will become a father. Our reading skips over a crucial part of the story: Zechariah is skeptical that this will really come to pass. Because his skepticism causes him to question the angel, he is left unable to speak until his son was born. And at that moment, he lets forth with promises for God’s people: the role his own child is to play in the long story of salvation. His son, John, will usher in this Messianic era, where the long wait will final be over for God’s promises to be fulfilled. A people waiting for the promise…A priest waiting for his turn at the altar…A father waiting for his child…A man waiting to speak…Waiting is prayer. We have become a people unaccustomed to waiting. The ubiquitous presence of the internet and the power of microprocessors in our pocket have made it such that we have become convinced that there is no longer any need for waiting. Things like memorizing trivia and shopping at the mall are becoming relics of the past. TVs with fixed schedules are becoming as obsolete as rabbit ears or black and white sets. There are not many places we still wait, but there are a few: traffic, the post office, the DMV, and the doctor’s office. And I’m not sure many of those are places we would identify as places of prayer, where waiting can take on a spiritual element. But maybe that’s because we haven’t been going about it the right way. I have some thoughts about how to adjust…but you’re gonna have to wait. They then followed up on the children when they were teens and adults, observing that there was a strong correlation between the ability to wait and emotional and physical health. Recent technological developments have allowed researchers to determine that these differences are not simply manifested as behavioral differences, but are also borne out in differences within the brain itself. In other words, waiting is healthy. And waiting can be learned, no matter how old we are. We can learn a lot about waiting from Zechariah. For centuries, God’s people have been waiting. The priests, in particular, would have known the prophecies promising of God’s return, of a Messiah, an anointed leader, who would come and bring them their hoped for salvation. In Zechariah’s time, there would have been a particularly urgent-felt need to shrug off Roman occupation to restore self-determination and order to their corner of the universe. So when Zechariah enters the sanctuary to carry out the sacrifice, he has been praying for his family, their desire for children, a sign of hope in God. And he has been praying for the sake of all of his people, his tribe, his nation, and for their sign of hope in God. So when the angel appears to him and tells him his prayers have been answered, his immediate reaction is…disbelief. Surely it can’t be this easy. I don’t know about you, but I can sympathize with Zechariah. There are those times when I have been praying for something; and then, when it actually happens, I just can’t quite believe it. Is it that answered prayer sometimes disappoints? Do we somehow relish being doubters, preferring the half-empty glass to the one that quenches our thirst? Are we more comfortable with hopes that are unfulfilled than the ones that are made real? Has the world become such a place of predictability that surprise seems out of order? I think that’s the case for Zechariah. It’s not that he wasn’t a person of faith. The lesson tells us that both he and Elizabeth were exemplary religious observers. They were righteous, good folk who faithfully executed the demands of faith. And yet, I am quite sure that when Zechariah hears that his prayers have been answered – not just about the birth of his son, but that this same son will be a turning point in the salvation of the nation – that this surprising good news is such a deviation from his posture of waiting that it shocks him into doubt. It is this doubt that leaves him speechless. He is unable to utter a word, to tell people about his encounter. And he stays that way until it is time to name the newborn baby boy, at which point his tongue is unleashed in a flurry of prophecy. For Zechariah, it was this imposed silence that shifted him from a posture of waiting to a practice of waiting. And that shift made all of the difference. No longer was he simply used to the “way things are” – he was now forced into silence and solitude. It was such a dramatic turn that he would likely never take the gifts of God for granted ever again. Which brings us back to the post office. I have actually gotten to where I no longer dread going to the post office – in fact, I now actually kind of enjoy it! Part of it is just a simple shift in expectation. I know I’m going to wait. No matter how many times I might sigh loudly and dramatically, the line never moves faster. No matter how many heat daggers I might stare into the back of the customers who act as though they’ve never left the house before, no matter how many times I stare in disbelief at the number of counters that are unstaffed, none of that will ever make time move faster. In other words, we can transform the frustration of waiting into a spiritual practice of intentional thinking, of God’s desire, of prayer. Now, when I know I need to go to the post office, I make peace with the fact that I am going to be there for a while. I no longer drum my fingers or pull out my phone to pass the time. Instead, I pay attention. I observe the people who are in line with me. I pay attention to the employees who used to be the object of my impatience. I notice things about them: the woman who needs a cane to walk; the man with a thick accent who is doing his best to make it through this transaction conducted in a foreign language and in a foreign culture; the couple with the kid who is more bored than I ever possibly could have been; the employee who hears the sighs and the comments about how long it takes and just absorbs or ignores it. And I pray for them: for comfort, for healing, for strength, for joy, for safety, for peace. Don’t get me wrong: I haven’t completed the transformation into a paragon of patient virtue. Even at the post office, I sometimes still convince myself that I am in a hurry, and that my hurry is more important than the hurry of everyone else there. But what I have learned is that waiting can be a gift, that it can be prayer – if I let it be. Today, in addition to celebrating this season of Advent, we are also celebrating our beloved Francisco Flores. For twenty years, Francisco has worked tirelessly as our custodian. And now, at the end of this year, he is retiring. For him, for all of us, there is a kind of waiting at work. And here is my word to speak into that waiting – or, indeed, into any waiting: let it be prayerful. Pay attention to what is around you. Take notice of those things that you can surround with prayer. Lift up those prayers: prayers of thanksgiving, of intercession, of passion, of sorrow, of joy, of hope. And beyond all else, trust that, whatever this season of waiting might mean for you, that God is already there on the other side of it, preparing the promise and waiting patiently for us. May this be the trust which holds us all of our days. Our lesson this morning comes from the prophet Isaiah. As has been foreshadowed for some time, the nations of Israel and Judah are doomed. The prophets have warned about this, that the people’s unfaithfulness to their covenant with God will be their undoing. Isaiah has joined his voice into the chorus of doom. But now, Isaiah preaches comfort. God will not abandon you, Isaiah tells them. You will face national humiliation. The Temple will be destroyed. You will be torn from home and into exile. But God is still God. And you, despite evidence to the contrary, will be God’s people. We often end up reading Isaiah during the season of Advent, as we await the Christmas celebration and the birth of the Word made flesh. We see Isaiah’s teaching about a “voice crying in the wilderness” as speaking of John the Baptist. We hear his preaching about the suffering servant as pointing to Jesus himself. And Isaiah’s message of both uncomfortable truth and truthful comfort is reflected in Jesus’ own ministry, where he challenged the unjust status quo and embraced those who have been cast to the side by “decent society”. Jesus, too, prophesied the destruction of the Temple while encouraging those who might listen to repent, return to God, and be faithful. Much like the Rabbinic legend of Isaiah’s being sawn in two by the order of the King of Judah, Jesus is crucified as Herod looks down from his throne. And in both cases, God’s truth cannot be stopped by death. Every day, it seems, we are brought the news of this or that terrifying trend in our world. Gun violence, terrorism, racism – all of these seem to us to be immediate threats to our way of life and proof that we need to barricade ourselves in order to maintain the status quo. Nothing can dissuade us from this opinion, not even the overwhelming evidence that we are safer now than at any other point in human history. Don’t get me wrong: injustice and violence are very real. There are awful trends that are on the rise. And yet, even accounting for all of this, as a whole, we are living longer and safer lives than we ever have. What is also different, unfortunately, is that we are living in a world of 24-hour news and social media where any knucklehead with a smart phone can broadcast his ignorance to the world, and where every threat seems like it’s next door. We hear about things we never would have known about before. Add to this the fact that fear sells, and business is booming. And it is in this context that our calling as a church finds its voice. There is, I believe, a line of continuity from Isaiah through Jesus and into the Church. We are the ones who call Jesus both Lord and Savior. We try to follow in his footsteps while keeping healthy doses of mercy, recognizing that we will never do it perfectly. And we are those who find continued purpose, meaning, and direction in the word of our God. In other words: we should be able to distinguish between those things that are temporary and those that are permanent and place our value accordingly. Friends, none of this is permanent. Church buildings may last a long time, but they don’t stand forever. Music may be remembered fondly, sermons may be quoted, but they are still relatively fleeting in the grand scheme of things. We may have live lives, but we are not immortal. Neither borders nor nations are fixed. Languages may grow, shift, change, and adapt, but they also die. There is one thing, and one thing only, that is eternal: the word of God. And in this season of Advent, it is really the only thing for which we should faithfully wait. Christmas Eve can be lovely. Candlelit hymns achieve beauty. Christmas mornings can bring joy. But none of them are really, truly, in that ultimate sense, worth waiting for. What would it look like if we lived as though the word of God was the only thing that mattered? How would our lives be different if we put everything in service of God so that whatever else we did was filtered through its unique lens and seen through its focus? What would it mean if our faithfulness and obedience were to Christ, and Christ alone? This past Wednesday night, as reports came across of the mass shooting in San Bernardino, California, I did something I regret: I followed the news on Twitter. I’m not a big fan of Twitter, but I have come to learn that it has value in getting breaking and local news. It also, it turns out, is where the world goes to vent its hateful spleen. There was little information, but a great deal of conjecture, about what happened. It felt like everyone was gleefully cheering for the “right” kind of shooter. Many were trumpeting that the attack had all the hallmarks of a right-wing extremist. Others were sure that it was Islamic terrorism. And still others were convinced this was a workplace dispute turned deadly by lax gun laws. As I watched this “conversation” taking place, I was appalled by what I saw. And I was convinced that we were going to end the evening in an all-out American Uncivil War. And then the press conference started. The San Bernardino Chief of Police and an FBI Spokesperson fielded questions with the kind of care and caution that good police work and investigation demand. They refused to speculate or jump to conclusions that weren’t sure yet. And they reiterated, again and again, that they would follow where the evidence led them. It almost restored my faith in humanity – almost. By now, it seems certain that the attack was religiously-motivated. The couple did not appear to have had any formal connection to Daesh (that is, ISIS), but were rather inspired by them. Gauging by the reactions I have seen, this conclusion has done little to dissuade people from believing what they had already believed. Those who were anti-gun are still anti-gun. Those who were anti-Muslim are still anti-Muslim. Those who were anti-immigrant are still anti-immigrant. I don’t know if anything I say will convince any of us to change our minds about any of this. That’s up to each of us on our own, and whether we are truly open to being transformed. But here is the question that I want to ask each and every one of us: what is it that God wants you to do? What is it that faithfulness to the eternal word of God calls us to do? Fear is powerful. But it pales in comparison to faith in the God we know in Jesus Christ. The challenge is to ask ourselves constantly what God would require us, even – and especially – when we are afraid and terrified. It is when we stop asking for God’s wisdom that we risk putting ourselves in the service of the things that will not last. This afternoon, a few of us will be heading over to Mercer’s Tucker campus for an interfaith gathering called “We Refuse to Be Enemies”. If you’re interested in coming along, please let me know. I, for one, am going because I have developed friendships in the Atlanta interfaith community. I have learned a great deal through these friendships. We do not gain anything by using our differences to build barriers around our communities. Nor do we gain anything by pretending that there are no differences. Instead, what strengthens us is being honest about those differences while opening ourselves to the possibility that we might be changed for the good – me by them, and them by me. In short, I am not going because I believe it is an easy thing to do, or a polite thing to do, but because I believe it is a faithful thing to do. The word of God calls us to cross boundaries, because God is the God of all peoples. It calls us to recognize and embrace the dignity inherent in each person, because we are all created in the eternal image of God. And it calls us to go into places of discomfort not for the sake of following our own desires, nor the desires of our tribe or nation, but the desires of God. Those are the only desires that matter in the end. However it is that this moment in time speaks to you, the one thing I commend to you is to seek God’s desires prayerfully. That is where you will find true faithfulness. And when we bring those Godly desires together, as the church, we cannot be stopped. My friends, we are the Church. We are the body of Christ. We are the people of the Word. We are the ones for whom we wait. All those names in our lesson this morning! Bozkath. Huldah. Hilkiah. Shaphan. Achbor. Beyond the advanced Hebrew pronunciation exam, there is a story at the heart of our lesson. Josiah, who rules in the southern part of the now divided kingdom, is in Jerusalem, the capital of Judah. He is really the last gasp of faithfulness in the long line of kings before the final descent into destruction and exile. It is on Josiah’s watch that this ancient scroll is rediscovered in the temple, at which point he sets about instituting a lot of reforms. He orders all of the altars and pillars and places of worship dedicated to other gods destroyed, centering the true worship of the one true God back in the Lord’s temple. Since David’s time, the overall trend has been away from such centralized, monotheistic adoration. The gods of other nations have made their way into Israel and Judah, and the people have forgotten about their covenant with God, the one that was a two-way promise of devotion. It’s that time of year again. Advent begins today, with Christmas lying just around the corner. As the title of our worship series implies, this is a season of waiting. There is the season of waiting that our society has built up around Advent and Christmas, mostly having to do with purchasing and spending. We mark the ancient season of waiting, the four hundred years that passed between the last of the writings of the Hebrew prophets and the arrival of the Christ child. And, perhaps most importantly, we recognize that we are still in a season of waiting. Christ was born, lived, served, died, and rose again, and so we see glimpses of the kingdom, of the world as God desires – but imperfectly and partially so. And so we wait, ultimately, for God’s perfecting. That’s not fully true, though. Waiting implies passivity. It brings up images of waiting rooms, where time is water down a drain. And if all we are doing is sitting around, it frees us of any responsibility. Life, then, becomes a commodity to be consumed – and the secular interpretation of Christmas is actually quite faithful. Jesus is coming, and will fix this mess. In the meantime, let’s shop! But waiting isn’t nothing. Waiting, faithful waiting, is active. Waiting requires patience. Waiting demands that we pay attention. And waiting takes practice. Patience. Paying attention. Practice. These three are the bedrocks of faithful waiting. Patience. How many of you would describe yourself as patient? Wait – don’t raise your hands yet! Patience does not come naturally to many of us. This is particularly true in our quick fix, buy it now culture. There’s a reason it is said that patience is a virtue. If it were easy, there’d be no virtue to it. In Arabic, the word “patience” and the word “cactus” come from the same root. That may be all we need to know about patience. The cactus, of course, patiently waits in the desert for the rare rainfall, soaking it all up and storing it for the long dry season. Cacti manage to stay green and bear fruit, even when the world around it appears dead. If I’m honest, though, the truth is that this “nothing” has more to do with my distracted attentions than with any kind of deserted soul. The truth is not that God is absent; it’s that I haven’t really been patient. It’s like the prayer: “Lord, give me patience, and give it to me now!” I’m not really waiting. I’m trying to force it, to move it forward of my own accord. That’s what gives me sympathy for the people of Judah in the time of Josiah. They, too, were looking for that quick fix. And when Yahweh, the God of their covenant, wasn’t “doing it for them”, they started looking for others who might give them what they wanted rather than what they needed. We may not believe in gods in the same way, but the truth is that we have plenty in our lives that we treat like a god. If you drive through my neighborhood this time of year, you would be forgiven for thinking that the flags boasting the big letter “G” would be for “God”. The “GT” would be, what – God’s Temple? The point is that God is at work. God is close by. God’s time is not our time, so God does not hurry. But God does not tarry, either. And so, just as patience is key to faithful waiting, so is paying attention. There is an image that comes to mind of the patient person: the monk meditating in solitude and quiet, with eyes closed, serene and oblivious to the world around. But faithful patience is far more tuned in. If you’ve ever sat outside for any period of time, you know exactly what I mean. At first, the world seems to be still. The breeze might rustle the leaves on the trees. There might be the distant, quiet sound of a birdcall. But look carefully, and the world is alive! Ants and little critters rush about. Birds circle overhead. Chipmunks dart around in the underbrush. There is more to life than initially meets the eye. The same is true of paying attention to the world around us at any time. We know this, don’t we? If we are talking to a friend and ask them, “How are you?” And they respond with a curt, “fine”, with arms crossed protectively up around their neck, we know enough to know that there might be more than first meets the eye. And that’s the kind of paying attention for which we can strive. When we do that, we will notice that God’s signs are all around us, all the time – just waiting for us to open our ears and eyes and hearts. In our lesson this morning, Josiah orders that the temple offerings be entrusted to the workers. No sooner does this happen than word comes that the Hilkiah, the high priest, has discovered the scroll of the law. Shaphan reads the scroll to Josiah, who then sets about restoring the narrow focus of Judah’s spiritual desires on Yahweh. It is almost as though Josiah’s order to them to turn over the money allowed them to pay attention to the things that mattered, such that this so-called lost scroll was rediscovered. Patience clears the path. Paying attention watches where our feet land. And practice brings it all together in trust. The only way to pronounce some of these Hebrew names is practice. And even then, you might not know for sure if Josiah’s mother’s name was Jedidah or Jedidah. This whole life of faith is somewhat unnatural. We are wired from birth to worry, first and foremost, about ourselves. From there, we are trained and urged to care about slightly widening circles: our parents, our immediate family, our extended family, our tribe. And yet, faith – faithful waiting – calls us beyond our tribe to the whole of God’s family. And, faith also calls us to the very heart of God’s self! And yet, the only way we can even conceive of this possibility is to practice it. We grow in patience by practicing it. We learn to pay attention by practicing the art of it. And in that practice, we will be drawn into the heart of God and God’s desires. It is these desires that will spur us to action, knowing that we will not be able to finish what it is that God alone can finish – and yet, we can be a part of what it is that God is building! What is it that God is building at the moment? What is it that this moment in this world is calling us to be and do as people of faith? Everywhere we turn, it seems, there is violence, and much of it supposedly fueled by religious zeal. The latest was the fatal shooting at a Colorado Springs Planned Parenthood clinic on Friday night – one of the dead was an officer who was also a pro-life leader in his church. Our airwaves – and, by extension, our hearts – grow polluted with extreme, violent rhetoric. And though most of us may never act out on these destructive thoughts, the truth is that words matter – more than we think we allow them to affect us. Words become flesh. That’s what Christ shows us. And just as promises come to reality, so do threats. This brings me to a little commercial: next Sunday, at 2pm, just around the corner at Mercer’s Atlanta Campus, is an event entitled “We Refuse to Be Enemies.” The event will feature Muslim, Christian, and Jewish religious leaders and is part of an ongoing effort to confront the violence and extremism of words and actions while also increasing partnership and connections. If you are interested in finding out more about this event or even attending next Sunday, just let me know. You see, even in a world where it feels like we are pulling further and further apart from each other, there are those places and glimpses of where God is already at work. We just have to be sure we are patient and paying attention so that when the opportunity arises, we can jump in and get down to practice. And then, and only then, can we begin to understand the truth of the God whom we seek. You might not know it from the way our society keeps time, but Advent begins next Sunday. Four weeks later Christmas begins, a season of its own that lasts 12 days. But in the world outside the church, where ringing bells have historically meant ringing cash registers, Christmas started before Halloween. We might roll our eyes at the commercialization of it all, but we eventually fall in line and shop our way to the manger. Because truth be told, we don’t really like to wait. And yet, the season of waiting begins. We are supposed to be a people who know how to wait. Twice a year, we set aside time in the calendar to do just that: to wait. Before Easter, we have Lent: a period of weeks meant for self-reflection so that we might celebrate the resurrection with readied joy. And before Christmas, we have Advent: a season of joyous expectation at the birth of the Christ child. But in 2015, why bother waiting at all? Do you want to watch a movie? Just figure out whether it’s on Netflix or Hulu and watch it. Want to buy a product? Hop onto Amazon and it’ll arrive in two days – or, in some places and some products, two hours! Waiting, it seems, is no longer relevant. It has become something quaint that people did way back in history, like, in the 20th century when we lived uncivilized lives. Our phones were only used for talking to people! When we wanted to buy something, we had to put on clothes and leave the house! People used things like postage stamps! I mean, we were practically Amish! I kid, of course; but the truth is that the pace of technology and change seems to be consistently accelerating. We have become really good at asking what we want and figuring out a way to get it without necessarily asking what we need. And in the process, we are losing the ability to wait. I’m convinced that this is not just a question of temporary impatience; this is a matter of spiritual survival. Of course, if you know me, you know I love technology. I use it all of the time. I am an impatient person by nature. So you would think I would be thrilled with the direction in which we are moving. And the truth is I am. And that terrifies me. I am exactly the kind of person who needs to be reminded to slow down and wait. At the heart of Advent is waiting. It was born in the early years of the Church. The four weeks of Advent is meant to mirror the forty days that Noah carried the animals in the ark, the forty years that Moses led the people in the wilderness, the four centuries of Scriptural silence that followed the last of the prophecies of the Hebrew Bible. Each of those moments led to something momentous. Noah and his family found a cleansed planet to begin again. Moses’ people had left slavery behind and moved into a future of promise. And God’s silence was simply waiting for the birth of the Messiah, Jesus, the Christ child. Seasons of waiting always, always pay off – maybe not in the way we expect or want, but in the way that we probably need. And that’s the other thing about waiting. We wait not just to remind us of what happened before, but to remind us that there is more yet to come. This world is far from the way that God desires it. But I don’t need to remind you of that, do I? Every day this past week has brought news of this attack or provocation as the pitiful Caliphate of Raqqa – or Daesh, the so-called Islamic State – gains far more recognition than their actual power deserves. These feel like scary times. And, indeed, if it feels scary, that’s all we really need to be scared. Meanwhile, we revisit this arcane holy day in the church calendar of Reign of Christ, or Christ the king: the moment for which we wait, when Jesus will be in charge of it all. It is, after all, the promise of the lesson we read today. After Isaiah pronounces God’s judgment on God’s people, of a once sacred vineyard now destroyed, he then reiterates that God’s promises cannot be defeated by human pettiness. The once mighty tree of Jesse, the father of King David, will sprout again. And this promised one to come will be just, righteous, fair, wise, compassionate, faithful. All he will need to do is speak and those wicked and violent destroyers will be gone! The disciples believed that Jesus was the fulfillment of these prophecies about the Messiah. And because of that, they can be forgiven for thinking Jesus’ kingdom was to be a political one. If we remember, as they prepared to join him in Jerusalem on Palm Sunday, they were convinced he was going to lead them in armed revolt, driving our King Herod and his Roman overlords, restoring the kingdom of Israel to its rightful lineage. As we know, the story didn’t quite turn out that way…but Jesus did tell them he would come back. And so, not content with failing to learn our lesson once, we have built up the mythology around this return of Jesus so that it will be the militant overthrow of evil powers that Jesus failed to accomplish the first time around; but this time, it’ll star Nicolas Cage and Kirk Cameron! Not that we sit idly by. But if we, for even a moment, think we know what it is that God has in mind, we really haven’t learned anything. In the meantime, we build the kingdom.. We do our best to follow Isaiah’s promise of the coming Messiah. We delight in the awe of the Lord. We give justice and righteousness to the poor, and fairness and equity to those who suffer. We clothe ourselves in faithfulness. We follow what it is that Jesus taught us to do: to feed the hungry; to give drink to the thirsty; to clothe the naked; to visit the prisoner; to welcome the stranger. And we do these things because Jesus told us that when we do these things, we do them to and for Jesus himself. Friends, I have to be honest with you. I have been seething this week. Our political climate has disheartened me in brand new awful ways. I have never been a fan of presidential primary season, because it tends to appeal to the worst and most extreme segments of our society and widens gulfs that already exist. I know that being angry is not always the most helpful approach in our ever-dividing world of blue and red, conservative and progressive, tribe and tribe. I get that there are reasonable political differences of opinion when it comes to just about every political issue we address as a nation and as a world. I want to be a good steward of my citizenship, and I want to engage in those conversations – those reasonable conversations. I have tried on other ways of seeing the world and being in the world; but I have found no other way that calls the best out of me and restrains the worst in me and puts all of it in a context that just makes sense to me. And so, because of that, regardless of my politics, I am horrified by the rhetoric and the decisions being made around refugees. Like I said, politics is one thing. But if, as a politician, you cloak yourself in faith, and if you claim that your faith – your Christian faith – is a qualification for office (which is problematic for all kinds of reasons), then just as you must feed the hungry and visit the sick, you must welcome the stranger. The faith that God makes real, physical, embodies in Christ calls us to many things. It even calls us to things that contradict our natural inclinations. One thing it never calls us to us is self-preservation – not personal preservation, not family preservation, not institutional preservation. We cannot follow Jesus at the manger and leave him when he flees to Egypt. And we certainly can’t ignore him at the cross. What we do, especially during this season of waiting, is follow as faithfully as we can. We live as faithfully as we can. We act as faithfully as we can. In other words, we build the kingdom – not of our own design, but of God’s. We do so prayerfully, led by the light of the manger that shines even in the shadows of the cross. And where we fall short, where we misstep, where we go off track, we lean into the grace of God that makes all of this possible. If not even death can defeat Jesus, how can we think that our imperfections can derail God and God’s desires? That’s what this table is ultimately about. God meets us around this table, even with our imperfections and arrogance and uncertainty and fear and anger and despair and brokenness. In broken bread and poured cup we meet Christ, who chose his own brokenness as the means of healing the world. And we, following him, open ourselves to the hope that our brokenness and imperfections can be a means of healing a broken and fearful world. Perfect love – perfect, holy, sacred love – casts out all fear. So let us come to this table with the courage God desires. Let us come to this table to be fed and sated, so that we might have the strength to build the same kingdom we await. Today’s title is brought to you by the Redundancy Department of Redundancy. Isaiah sets up some heavy expectations in our lesson today. A servant of God is on the way. This one will bring justice and righteousness, and will do so with gentleness, meekness, silence, even. The blind will see, the prisoners will go free. What we have known is gone; something brand new is happening! Our text today was likely written when the ancient Israelites were in captivity in Babylon. They mourned what they lost when the Babylonian Empire conquered them, stormed Jerusalem, leveled the temple to the ground, and carried them east. And now, there seems to be a hint of the Persians rising even further east, led by King Cyrus. Could it be that he could topple Babylon and send the captives home? When we read this text during Advent, it sets us up for hearing it in a certain way. The servant Isaiah describes is Jesus – he is the gentle one who will bring these grand concepts into being, things like justice and righteousness. He is the one who will be crushed. He is the one whose birth we await, whose ministry we follow, whose dying and rising again are our cause for hope. And yet, whatever the Spirit may have intended for the understanding of this text, what was likely heard, initially, was God’s promise to the ancient Israelites that they would be that servant. As a people, they would act as a collective light to the world, a gentle people whose own way of being would exemplify justice and righteousness the way they ought to be. Echoing Isaiah, I’ve been throwing these terms around: justice, righteousness; but what do they actually mean? I have talked before about how we tend to associate “righteousness” with the individual, living rightly and piously and correctly; and that we tend to associate “justice” with communities, creating a society that is fair and equitable, where wrong is punished and good is rewarded. That said, in the Biblical languages, there is actually very little to distinguish them from each other. They are so overlapped and intertwined that it seems almost silly to have two separate words at all. In any case, there they are, our goal posts: righteousness and justice. So in light of these words, given the call of God’s people to be agents of justice and righteousness, how are we doing? It seems like an important conversation for us to have. Horrific words like “torture” and “racism” are emblazoned across our headlines, far cries from concepts like “justice” and “righteousness”. Before I say anything else, though, I want to say this: I have no idea what I’m supposed to say about any of this today. The past two Sundays, I have talked about the grand jury verdicts of Ferguson, Missouri, and Staten Island, New York, and about the Department of Justice’s report on the Cleveland Police Department. I know that to speak about these things again today risks going too far for some of you. It’s not that I have a problem with making us uncomfortable; after all, if the purpose of preaching is to speak to the gospel, then we should all, including the preacher, be at least a little bit uncomfortable. That’s not the issue for me. It’s a little more complicated. Sermons are monologues, not conversations. And if my preaching is marked by what some would call “ambulance chasing”, following issue after issue, week after week, then we risk becoming superficial, losing interest as soon as the news cycle does. We also risk becoming a church that only talks about the issues that the pastor cares about. And that’s a problem, too. More than that, I think we can do better. I think we can go deeper and wider in all of this. When we look at the world around us, we should be able to see beyond liberal and conservative, democrat and republican. We should be able to examine these things as matters of faith, discerning where it is that grace and sin are at work, where it is that we are called to minister, and how it is that we are to act as God’s agents, Christ’s hands and feet. And then I look back at our history as a congregation. Hanging out in the hallway is a framed reprint of the front page of the Atlanta Journal from 1957. 80 pastors, including our own, signed an open letter calling on Atlanta schools to follow the Supreme Court’s decision in Brown v. Board of Education. In 1960, the leadership of Oglethorpe took a stand on the role of race in worship, by affirming that they would “continue the present policy of seating anyone presenting themselves for worship.” The subtext is rich here. At the time, churches were becoming not only informally segregated, but formally so. African-American Christians were testing that resolve, arriving to worship in so-called “white” churches. In many cases, they were turned away, sometimes conveniently labeled as “agitators”. I am proud to say we made a very different decision, saying that all are welcome to worship here. At our twenty-fifth anniversary celebration, we invited Ambassador Andrew Young as our guest preacher. It’s hard to believe now, but in 1974, some considered inviting an African-American into the pulpit a step too far. This is our legacy, of taking stands that spoke out for justice and righteousness as we saw them. None of these, of course, happened without controversy, but they did happen. And, I can’t help but notice, they all happened decades ago. Look: I honestly don’t know what our next step should be. As I’ve said the last two Sundays, the issue of the treatment of young black men at the hands of police is not going away. What began as individual protests has now been galvanized into a movement. If the Christ child, whose birth we await again, was truly Emmanuel, God with us, then surely the church must be enfleshed in justice and righteousness in this broken world. I don’t know what the church is called to do, but I do know that we are not called just to sit by and watch. Fifteen years ago, I was working in Wilmette, a Chicago north shore suburb. That summer, a young white supremacist from Wilmette went on a shooting spree. He ended up killing himself, but not before killing and wounding several others. One of his victims was Ricky Byrdsong, the African-American coach of Northwestern University’s basketball team. While our church had no connection to the young gunman, the fact that he was from our town was a bit of a wake-up call. Out of that tragedy, our senior pastor and Coach Byrdsong’s pastor struck up a friendship. That friendship grew to include the leadership circles of both churches, and then eventually broader partnerships between the two congregations. This all happened in the year prior to my ordination, and so I cherish the memory of Byrdsong’s church being a part of that service. As vivid as that was, the moment that stands out more than any other was the first time our leadership circles got together at our church in Wilmette for conversation and coffee. They shared with us what it was like to be black and drive into Wilmette from Evanston, and how they often took a deep breath before doing so, especially at night. We were stunned! We had no idea. In short, it was a glimpse of our own sleepy little town through their eyes. This is what justice and righteousness do: bring sight to the blind, wisdom to fools, freedom to the prisoner. And when those moments happen, they are causes for joy. Where have you seen where you once were blind? Where have you heard where you once were deaf? Where have you been freed where you once were captive? Where have you been enriched where you once were poor? When the world seems hopeless, our causes for celebration remind us that God is not finished with us yet. Habakkuk is one of those mysterious Biblical characters about whom we know next to nothing. Most of the prophets, at least we know their place of birth; or perhaps their name might tell us something about them. All we really know about Habakkuk is the content of his prophecies, which help us place him some time around the Babylonian Exile. His name is even unrecognizable – possibly related to the word “embrace”, but unclear. What stands out about this prophet is his willingness to openly question God. Most of the prophets have their questions for God, but usually about their own worthiness to be God’s vessel. Jeremiah is too young. Sarah is too old. Moses stutters. Elijah tenders his resignation. Habbakuk, however, laments the current state of affairs. He knows God to be a God of what is just, what is right, what is true. But what he sees around him is injustice, wrong, and falsehood. He even has the audacity to suggest that the Law of Moses itself is broken. If it weren’t, then God’s people would be living out God’s desires, right? Who are we to question God from our narrow experiences? We may not comprehend for the moment, but surely God has a plan that is beyond anything we can imagine. It may not be clear for the moment, but clarity will surely come. In other words, our limited perspective should never keep us from crying out to God’s limitless mercy. The Hebrews, captive in Israel, call out to God for freedom. The Lamentations of Jeremiah are full of sorrow and distress. The psalms have litany after litany of agony and questions. Jesus himself quotes Psalm 22 from the cross: “Why, O God, have you forgotten me?” Intimacy with God is honesty with God. And if God is really God, then God can handle our questions, our frustrations, our observations, our anger and disappointment and distress. And if we can’t be honest with God, where can we let our hair down? These are the kinds of questions and concerns people of faith out to have foremost in our minds. Why does the world seem to be so unfair? With all of our advances, why does it seem like we’re constantly moving backwards? If we know what justice looks like, why is injustice rampant? These were the kinds of questions on my mind this past week as protests raged in the wake of the Ferguson Grand Jury decision. I’m not particularly inclined to focus on the decision itself; no one except Michael Brown and Darren Wilson knows exactly what happened that fateful night. And regardless of whether Darren Wilson exercised his best possible judgment, young Michael’s life ended far too short, and surely we can all grieve that. For many, though, Ferguson has become a touchstone, a reminder of what it still feels like to be young, black, and male in America. I can’t, for a moment, pretend to walk a mile in those shoes. 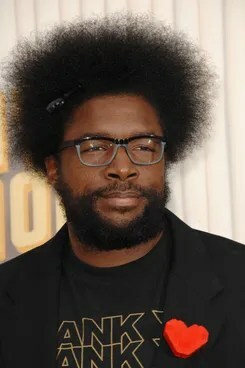 Ahmir Thompson, better known as Questlove, can. I don’t expect us to feel sorry for a celebrity. I don’t expect us to be of one mind about Ferguson or race in America. And I don’t expect you to agree with me or my point of view. What I do expect is that we would be willing to see life through the eyes and experiences of others, to get a glimpse of what it feels like to be them. In times of anger, compassion is in rare supply. What I hope, more than anything else, is that we would see moments like these as times to return to God and to the things that make for faithful living. The outcry from Ferguson isn’t going away any time soon. The question is what we do about it. When Habakkuk points all of this out to God, God does not silence him, or put him in his place. Instead, he challenges him to do something about it. And as he does, the prophet is brought to this amazing insight: the world is unfair; but God is still God, and there is still reason to rejoice. The world may be upside down. We may not understand why. And yet, God is still to be praised – for deliverance, for strength, for the opportunity to make a difference in the world. Each year we begin the season of Advent by waiting for the return of the Christmas miracle, the birth of the Christ child. And in that miracle, we are reminded that God has not given up on this world, not by a long shot. God has great hope for us yet. At Oglethorpe Presbyterian, we are installing two Advent prayer wreaths. Along with the prophet Habakkuk, we are invited to add our reasons for rejoicing, whether great or small. We will add them week after week to our wreaths, so that they might become symbols of our hope in Christ, a reminder of God who still believes in us enough to love and cherish us. My personal hope is that these wreaths with these prayers would be our own small act of prayerful rebellion in a broken world. The time will come when no one frets an empty stomach or worries over a roofless night or fears making others afraid. If it delays, wait for it. It is coming. And until then, may these moments of rejoicing be our hopeful sign that God is still at work within us, within this world. Friends, rejoice in hope. It is our most faithful act. My family’s season starts on the first Sunday of Advent. We go up to Brookhaven Christian Church, where we buy our tree. We put it on a stand, but we leave it out on the back deck, undecorated. We also put out our Advent wreath that day with its five candles, as well as the olive wood nativity set we bought in Bethlehem some years back. Each day, we add something to the scene. 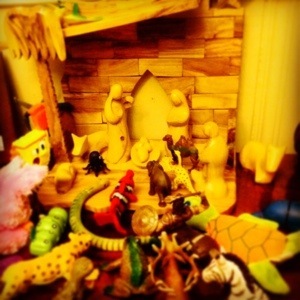 We start with the wooden animals, but there’s only about two or three of those, so pretty soon we are adding toy animals – tigers, elephants, ladybugs, dinosaurs – somehow a centaur and Iron Man both end up part of the scene, too, by the time it’s finished. Meanwhile, Mary and Joseph make their way across the house, a little bit each day, arriving on December 24. That’s also when the tree comes inside and gets decorated, so it really does feel like Christmas is almost here. Baby Jesus gets to the manger on December 25, way ahead of the kings, who are still moving across the floor until Epiphany on January 6. On January 7, the decorations get put away, the tree goes to the curb, and the season comes to a close. We initially started this as our own little feeble protest against the secularized, commercialized Christmas. It seems that every year, the season starts earlier and earlier. Advent simply doesn’t exist at all, and the twelve days of Christmas is just a song that has too many verses. You have no doubt noticed how successful our protest has been, making no difference whatsoever. Over the years, though, our initial reasons behind these traditions have faded as the traditions themselves have revealed new meaning for us. We light the Advent candles and read readings together each night, a time of closeness and reflection. As the stable gets more and more crowded, our anticipation builds and builds, even though the major players haven’t yet arrived. Christmas Eve is the transitional moment from joyful expectation to outright celebration. The twelve days of Christmas get their full due as we enjoy the season as fully as possible. And here’s a little pro tip: if you send your cards before January 6, they’re still Christmas cards. What it all means is that our season ends up just a tiny bit out of step with others. And you know what? I kind of like it that way! I think the author Flannery O’Connor said it best: “You shall know the truth and the truth shall make you odd.” Being a person of faith means being in the world, engaged and loving and participating. But it does not necessarily mean being of the world, taking the world’s values as our own. In other words, tonight we come to Bethlehem to worship the Christ child, Emmanuel, God with us. But if we set up shop in Bethlehem, we’re missing the point. We have to go back to our lives, our jobs, our relationships, our stresses and challenges. But we return different, forever changed by a holy encounter. We re-enter our world marching to the beat of a different little drummer boy. We should be just a little bit out of sync, because we live in a world that has its own values. It’s not about being hostile or paranoid or angry or suspicious; quite the opposite, in fact. It’s just that keeping up with the Joneses really should have no hold on us anymore. Instead, we love more fully, more selflessly, more generously than we have ever loved before, because here in the crowded stable, we are loved more fully, more selflessly, more generously than we have ever been loved before. But what is our sacred sign? May love be our watchword this night, and, indeed, all throughout the year.